When Stevie Wonder turned 21, he took on the Motown machine, and he won. Wonder was an 11-year-old child prodigy when he signed with Motown. At that time, the deal was that Motown would put all of Wonder’s earnings in a trust, and he wouldn’t get control of that trust until he turned 21. In the meantime, Motown would pay him a tiny weekly stipend and pay for his tutor. And for a full decade, Wonder worked as a cog within the Motown machine, cranking out singles written by, or co-written with, the in-house songwriters. That approach worked for a while, but it couldn’t contain Stevie Wonder. Wonder first hit #1 with the electric 1963 live single “Fingertips (Pt. II).” Throughout the rest of the ’60s, he never got back to the #1 spot, but he landed in the top 10 again and again. And during that time, he grew. He learned more instruments. He started writing and producing his own records. He got married. And then he turned 21. Once he hit that birthday, his contract with Motown was up. All of a sudden, he had leverage. He used it. When Stevie Wonder re-signed with Motown, he had a new set of demands. He wanted complete artistic control, which would effectively free him up to stop working in the Motown hit factory. He also wanted his own publishing, and he wanted a better royalty rate. He got everything he wanted. Motown bet on Wonder. This turned out to be a smart idea. During the ’70s, in quick succession, Stevie Wonder cranked out Where I’m Coming From, Music Of My Mind, Talking Book, Innervisions, Fulfillingness’ First Finale, and Songs In The Key Of Life. He won Album Of The Year Grammys in 1974, 1975, and 1977. (When Paul Simon won the award in 1976, he thanked Stevie Wonder for not releasing an album that year.) And when Wonder stopped focusing on making big singles, his singles suddenly got bigger. In 1973, a 22-year-old Stevie Wonder returned to the #1 spot on the Hot 100 for the first time in nearly a decade. “Superstition,” the song that returned Wonder to chart supremacy, could’ve been a Jeff Beck song. Beck, the UK blues-rock guitar wizard, admired Wonder’s music, and he wanted to work with him. So they came up with a deal: Beck would come in and play some guitar on Wonder’s album if Wonder would write a song for him. One day, Wonder and Beck were fooling around in the studio, and Beck started playing a beat on the drums. Wonder told him to keep doing it, and then he began improvising on a Hohner Clavinet, a sort of electronic harpsichord that would let you phase back and forth. That’s when Wonder came up with the “Superstition” riff and some of the song’s lyrics. That day, Wonder and Beck recorded a demo of “Superstition,” and Beck was all set to cover it and release it as a single. But Berry Gordy was not going to let that happen. Wonder might’ve won creative control of his albums when he negotiated his new Motown deal, but his Motown bosses still got to choose which of his songs could become singles. Berry Gordy knew “Superstition” was a hit. Meanwhile, the debut album from Beck’s new group, a power trio that also featured former Vanilla Fudge members Tim Bogert and Carmine Appice, got delayed. Beck, Bogert & Appice eventually did release their “Superstition” cover, but it came out after Wonder’s version was already a hit. Beck was crushed about that, and he grumbled about it in the press. But the song was never Jeff Beck’s. He was just lucky to be there when Stevie Wonder put the pieces together. (Beck’s guitar only made it onto one of the songs from Wonder’s Talking Book album.) And though Beck’s “Superstition” cover is cool, it has nothing on the original. 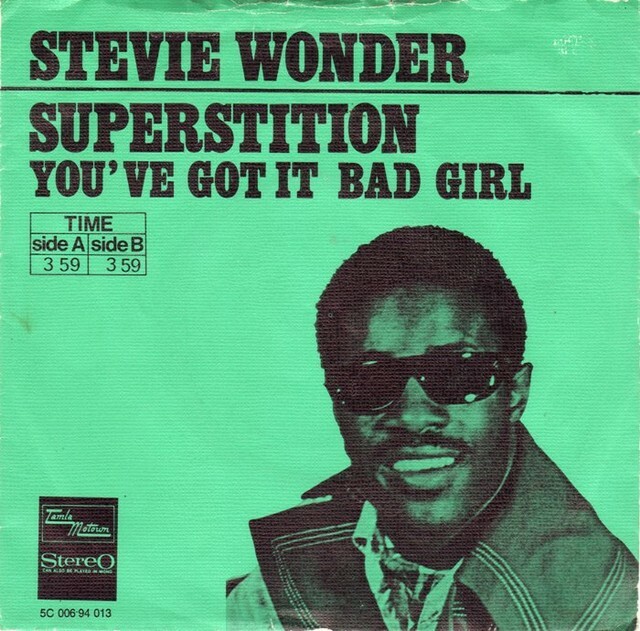 Wonder didn’t just write and co-produce “Superstition”; he played every instrument on the song except the horns. The monstrously funky Clavinet riff was so complicated that nobody else could figure out how to play it, and years later, it came out that it was really eight different Clavinet parts edited together. And yet it sounds intuitive, like a guitar riff. “Superstition” came out after Wonder had spent much of 1972 on tour with the Rolling Stones. (The Stones had opened for Wonder back in 1964, when he was a child phenom and they’d only just arrived on the scene.) And maybe it’s not an accident that Wonder came up with the riff with Beck in mind. It’s a huge, nasty stomper of a song, one that has as much in common with the Stones or Led Zeppelin as it does with Wonder’s Motown contemporaries. And yet “Superstition” is still a soul song, with its perfectly timed horn stabs and its squechy low end. Wonder sings hard on it, too, hitting pinched and churchy high notes that swoop in over the churn he’s generated. The lyrics are gnomic opacities: “13-month-old baby broke the looking glass / Seven years of bad luck / The good things in your past.” But there’s a concrete meaning to the song. Wonder is singing about how we shouldn’t believe passed-down wisdom: “When you believe in things that you don’t understand, then you suffer / Superstition ain’t the way.” Maybe that’s an oblique critique of racism, or conservative policy, or any other handed-down hang-up. But Wonder was already singing in riddles. And ultimately, the lyrics mattered a whole lot less than that earthshaking groove. Wonder was, and is, famous for being an absolutely electric, transformative live performer. We can hear that as early as “Fingertips (Pt. II),” and we can see it for ourselves everytime he plays live now. But “Superstition” is something that Wonder put together in a studio, playing around with synthesizers — the Clavinet, the Moog bass — and using the studio as an instrument. And maybe the coolest thing about it is that he still makes it sound like a sweaty, intense live performance.